Pastel pencils combine the control of a pencil with the soft mark of pastel. Many people are attracted to the "softness" of traditional soft pastels but are intimidated by the inherently "looser" medium. For some, controlling the powder of traditional pastels can be a real challenge. Pastel pencils can provide the "best of both worlds" by allowing the artist a softer finish with a more "controlled" mark. Pastel pencils are simply pastel material encased within a wooden shaft. Because they are in pencil form, they can be easily sharpened to a point and used to develop intricate details in a drawing. Colors can still be be layered, blended, and developed just as they would in a traditional soft pastel painting. 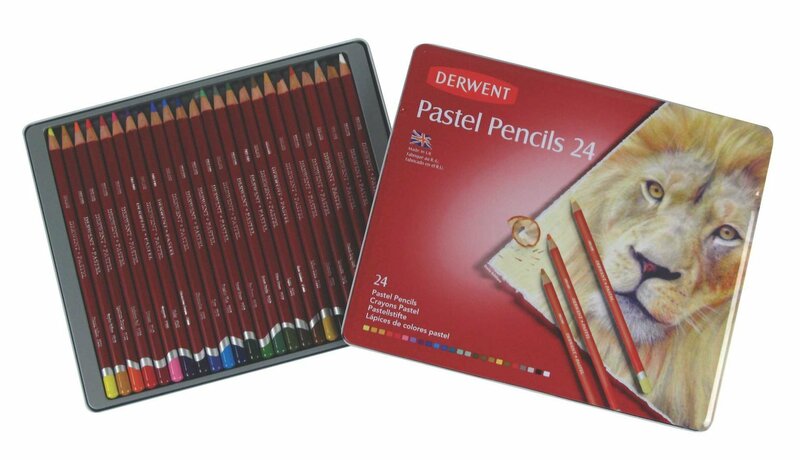 Pastel pencils can be applied to the drawing surface in a similar method as typical pencils. Using the side of the tip can produce broader marks, while using the sharpened tip of the pencil will produce controlled lines. There is noticeably less powder with pastel pencils, so several layers may be needed to produce a thick enough application to be blended with a finger or blending tool. Colors can be mixed and new colors created by layering colors on top of one another. Some blending will naturally occur as new colors are layered on top of existing applications. Once the wood has been removed, perhaps about and inch or two, a piece of sandpaper can be used to bring the pencil to a sharp point. Generally speaking, any surface that will accept the mark is suitable for use with pastel pencils. Drawing paper, illustration board, and bristol paper will all accept the mark. That being said, a paper with a heavier tooth or texture will provide the best results. Canson Mi-Teintes paper is my paper of choice. This paper is produced in various tonalities, providing nice contrast as colors are added. The medium tooth of the surface is also very accepting of the mark and layering of the material. Other papers with a heavier tooth are also great to use. Some printmaking and watercolor papers fall into this category. Printmaking papers can be picked up in a variety of tones while most watercolor papers will be white. Cold press or rough watercolor papers are best, as hot press papers will not receive the mark very well. Pastel pencils are a great complement to traditional soft pastels (not oil pastels). Many pastel artists use them for developing details within a pastel painting. They are also popular for use with watercolor applications. Colors can be enhanced with pastel pencil applications over the top of dried areas of watercolor. Of course, with any medium, experimentation is encouraged and "the rules" can always be broken.